Welcome to Parents and PGCPS: Conversations for the Engaged Parent and Dedicated Educator. I am your host Dr. Michael Robinson. Over the past several weeks, I have embarked on a journey across our beautifully diverse communities to talk with parents/families, educators, community and civic leaders regarding their views and perspectives about the future of education in Prince George’s County. Dr. Mike Robinson: As you know our school board has had challenges which many suggest prevents the Board from effectively leading one of the largest school districts in America. Please share your thoughts on the way the Prince George’s County School Board is operating currently? Lynn Jackson: The infighting between the members of the P.G. County Board of Education (BOE) combined with the lack of progress with the schools in my district have led to me losing confidence in our school board. As elected officials, the BOE needs to have more authority to make significant changes to our public schools that should focus on achieving real results, such as improving SAT and ACT scores, higher English and math proficiency rates, and ways to motivate our students to be at their best. Dr. Mike Robinson: Do you support Anthony Muse’s Bill for an all-elected school board? Lynn Jackson: I fully support the county’s bill to have a fully elected school board. The State Delegates and Senators in our General Assembly who voted to take the power of selecting BOE members out of the hands of their neighbors and to put it into the hands of the County Executive and County Council should be front and center to explain their reasoning for supporting House Bill 1107 (HB1107) of 2013. I support a fully elected school board because my neighbors and I should have the ability to get rid of school board members by voting for other candidates when our BOE representatives are not giving us the results that we want. Appointed officials are not swayed by the opinions of the community and are only satisfied with pleasing those with the power of appointing them. This is not how our democracy is supposed to work and it’s an insult to the residents of P.G. County to know that our elected officials in Maryland’s General Assembly voted to remove their neighbor’s power to fully control the BOE. 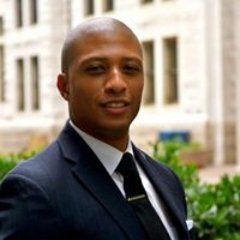 Dr. Mike Robinson: What do you say to those citizens of Prince George’s County when they say that they are tired of the school system overall not consistently educating all the children in this county? Lynn Jackson: I tell my neighbors who say that they are tired of our school system under-performing to do their research on the candidates who are running at the state and county levels, and to vote for people who are actually saying that they are going to improve our public schools by taking action. I tell my neighbors to stop accepting vague candidates that just say, “I want to improve our schools,” and to start demanding an explanation as to how exactly are they going to make improvements. The power of change rests with our voters and voters should demand a road map for exactly how they are going to turn our school system around for their votes. Dr. Mike Robinson: How do you think the perception of our school system is affecting the property value of homes, and bringing new industry into the county? What would you do to help improve the image and confidence in our school system? Lynn Jackson: The reality that P.G. County schools are under performing, and that P.G. County is one of the worst school districts in Maryland negatively affects property values and the prospect of new businesses coming into our county. I want to improve our image and the confidence in our school system by regularly meeting with the student in my district to motivate them, and to show them that a guy who came from the same place as they have been able to be a positive and successful member of our community. I want to get into the trenches and constantly meet with students in order to slowly change the culture of our schools and to make our students more goal oriented. I think personally interacting with students combined with giving the BOE the power to make significant changes can quickly change the reputation and results that many P.G. County Schools share. Dr. Mike Robinson: What is your vision for our school system? Lynn Jackson: My vision for P.G. County schools are for our students to have an average SAT scores of 1000 or more. I want average ACT scores to be in the 20s. I envision 85-90 percent of our students passing their English and math proficiency exams each year, and that same percentage of students graduating from our high schools each year. I can dream for perfect SAT and ACT scores and 100 percent proficiency results and graduation rates, but it’s not realistic. Some people just don’t care about their education. I also envision our students understanding that there are a place and a time to conduct themselves differently in different settings. I ultimately would like for our schools to produce students who are mature and prepared to face the world as young adults, and not as grown kids. Dr. Mike Robinson: As you know, many both locally and nationally say they have the answers towards improving education, however, little ever change, and the big losers are our children. What makes your vision different and how would you effectively make your vision a reality to make our school system better. Lynn Jackson: My vision for improving our education is different because I know that just throwing money at our schools will not fix their problems. The first step that I will take as a state Delegate is to amend HB 1107 of 2013 to get our BOE back to an all-elected school board. I will also modify the bill to shift much of the authority that our county CEO has to the county BOE. I want for the county CEO to be selected by our county BOE through a vote, and I want for our county CEO to directly answer to our BOE. Additionally, the BOE will be responsible for selecting their own chair and vice-chair through their own internal voting. I also want for every member of our BOE to be elected every 2 years and all at once, so that if parents and voters are not happy with their performance, they can elect others who they feel can do a better job. This amendment is an effort to get our community more involved and with getting P.G. County Public Schools back into the hand of our neighbors and voters. I also believe that giving the county BOE more authority and 2-year election cycles will force them to make the drastic changes in our schools that our community wants. Step two of my plan calls for getting support from graduate and undergraduate students in Maryland to come to high schools to help students that are having trouble with achieving their academic goals. I will host fundraisers to pay for selected students from Maryland’s Universities to come to high schools for a few hours each week to help our students make improvements. The money from the fundraisers that I will host will be used to pay for college students to use Uber or Lyft to get them to and from their assigned high schools. In return for the help that these students provide, I will personally write them a letter of recommendation for prospective employers and/or academic institutions and will also ask for Maryland’s Governor to write them a letter of recommendation. Step three of my vision is for me to spend time at Surrattsville, Gwynn Park, and Thomas Stone High Schools to work with our students personally. I’m pretty good with listening to teenagers and at finding ways to motivate them to dream of doing great things. I want to use some of the money that I raise from fundraising to bring motivational speakers to the schools in my district to get our kids to be motivated to come to school and to dream for the stars. My mission is for our kids to truly believe that they have a purpose in life, and to have a plan to succeed when they graduate.